3:11 Αὐτὸς δὲ ὁ θεὸς καὶ πατὴρ ἡμῶν καὶ ὁ κύριος ἡμῶν Ἰησοῦς κατευθύναι τὴν ὁδὸν ἡμῶν πρὸς ὑμᾶς· 3:12 ὑμᾶς δὲ ὁ κύριος πλεονάσαι καὶ περισσεύσαι τῇ ἀγάπῃ εἰς ἀλλήλους καὶ εἰς πάντας καθάπερ καὶ ἡμεῖς εἰς ὑμᾶς, 3:13 εἰς τὸ στηρίξαι ὑμῶν τὰς καρδίας ἀμέμπτους ἐν ἁγιωσύνῃ ἔμπροσθεν τοῦ θεοῦ καὶ πατρὸς ἡμῶν ἐν τῇ παρουσίᾳ τοῦ κυρίου ἡμῶν Ἰησοῦ μετὰ πάντων τῶν ἁγίων αὐτοῦ[, ἀμήν]. For what thanksgiving can we return to God for you, for all the joy that we feel for your sake before our God, as we pray most earnestly night and day that we may see you face to face and supply what is lacking in your faith? Now may our God and Father himself, and our Lord Jesus, direct our way to you, and may the Lord make you increase and abound in love for one another and for all, as we do for you, so that he may establish your hearts blameless in holiness before our God and Father, at the coming of our Lord Jesus with all his saints. 21:25 Καὶ ἔσονται σημεῖα ἐν ἡλίῳ καὶ σελήνῃ καὶ ἄστροις, καὶ ἐπὶ τῆς γῆς συνοχὴ ἐθνῶν ἐν ἀπορίᾳ ἤχους θαλάσσης καὶ σάλου, 21:26 ἀποψυχόντων ἀνθρώπων ἀπὸ φόβου καὶ προσδοκίας τῶν ἐπερχομένων τῇ οἰκουμένῃ, αἱ γὰρ δυνάμεις τῶν οὐρανῶν σαλευθήσονται. 21:27 καὶ τότε ὄψονται τὸν υἱὸν τοῦ ἀνθρώπου ἐρχόμενον ἐν νεφέλῃ μετὰ δυνάμεως καὶ δόξης πολλῆς. 21:28 ἀρχομένων δὲ τούτων γίνεσθαι ἀνακύψατε καὶ ἐπάρατε τὰς κεφαλὰς ὑμῶν, διότι ἐγγίζει ἡ ἀπολύτρωσις ὑμῶν. 21:29 Καὶ εἶπεν παραβολὴν αὐτοῖς· Ἴδετε τὴν συκῆν καὶ πάντα τὰ δένδρα· 21:30 ὅταν προβάλωσιν ἤδη, βλέποντες ἀφ᾽ ἑαυτῶν γινώσκετε ὅτι ἤδη ἐγγὺς τὸ θέρος ἐστίν· 21:31 οὕτως καὶ ὑμεῖς, ὅταν ἴδητε ταῦτα γινόμενα, γινώσκετε ὅτι ἐγγύς ἐστιν ἡ βασιλεία τοῦ θεοῦ. 21:32 ἀμὴν λέγω ὑμῖν ὅτι οὐ μὴ παρέλθῃ ἡ γενεὰ αὕτη ἕως ἂν πάντα γένηται. 21:33 ὁ οὐρανὸς καὶ ἡ γῆ παρελεύσονται, οἱ δὲ λόγοι μου οὐ μὴ παρελεύσονται. 21:34 Προσέχετε δὲ ἑαυτοῖς μήποτε βαρηθῶσιν ὑμῶν αἱ καρδίαι ἐν κραιπάλῃ καὶ μέθῃ καὶ μερίμναις βιωτικαῖς καὶ ἐπιστῇ ἐφ᾽ ὑμᾶς αἰφνίδιος ἡ ἡμέρα ἐκείνη 21:35 ὡς παγίς· ἐπεισελεύσεται γὰρ ἐπὶ πάντας τοὺς καθημένους ἐπὶ πρόσωπον πάσης τῆς γῆς. 21:36 ἀγρυπνεῖτε δὲ ἐν παντὶ καιρῷ δεόμενοι ἵνα κατισχύσητε ἐκφυγεῖν ταῦτα πάντα τὰ μέλλοντα γίνεσθαι καὶ σταθῆναι ἔμπροσθεν τοῦ υἱοῦ τοῦ ἀνθρώπου. And he told them a parable: “Look at the fig tree, and all the trees. As soon as they come out in leaf, you see for yourselves and know that the summer is already near. So also, when you see these things taking place, you know that the kingdom of God is near. Truly, I say to you, this generation will not pass away until all has taken place. Heaven and earth will pass away, but my words will not pass away. The following is from Luke 9:51–24:53, by Arthur A. Just Jr., Concordia Commentary series, copyright © 1997 by Concordia Publishing House. All rights reserved. “Here is the goal of Luke’s gospel: to enable the hearers, by grace, ‘to stand in the presence of the Son of Man’ (21:36). This has also been the goal of Jesus’ teaching from his first sermon in Nazareth and is the goal of his public catechesis, which concludes with these eschatological words. (He will have one more discourse for the Twelve in 22:21–38, but this is the end of his public teaching.) The words of Jesus, which will not pass away, accomplish what Luke promised Theophilus in the prologue: ‘in order that you come to recognize completely the reliability concerning the words by which you have been catechized’ (1:4). Theophilus and the other catechumens are prepared to stand in God’s presence on that apocalyptic day. In these words there is great comfort for all believers. The end is not to be feared by the catechumens but greeted with head held high as the Son of Man comes with redemption (21:28) to usher them to the heavenly banquet table (cf. 14:15–24; 15:23–27; 22:14–20)” (p. 806). English Scripture quotations are from the ESV® Bible (The Holy Bible, English Standard Version®), copyright © 2001 by Crossway, a publishing ministry of Good News Publishers. Used by permission. All rights reserved. The SymbolGreekU, NewJerusalem, Jacobite, and TranslitLSU fonts are available from Linguist’s Software, Inc., PO Box 580, Edmonds, WA 98020-0580, USA; telephone (425) 775-1130; www.linguistsoftware.com. then you showed me their deeds. 3:13 Τίς σοφὸς καὶ ἐπιστήμων ἐν ὑμῖν; δειξάτω ἐκ τῆς καλῆς ἀναστροφῆς τὰ ἔργα αὐτοῦ ἐν πραΰτητι σοφίας. 3:14 εἰ δὲ ζῆλον πικρὸν ἔχετε καὶ ἐριθείαν ἐν τῇ καρδίᾳ ὑμῶν, μὴ κατακαυχᾶσθε καὶ ψεύδεσθε κατὰ τῆς ἀληθείας. 3:15 οὐκ ἔστιν αὕτη ἡ σοφία ἄνωθεν κατερχομένη ἀλλ᾽ ἐπίγειος, ψυχική, δαιμονιώδης. 3:16 ὅπου γὰρ ζῆλος καὶ ἐριθεία, ἐκεῖ ἀκαταστασία καὶ πᾶν φαῦλον πρᾶγμα. 3:17 ἡ δὲ ἄνωθεν σοφία πρῶτον μὲν ἁγνή ἐστιν, ἔπειτα εἰρηνική, ἐπιεικής, εὐπειθής, μεστὴ ἐλέους καὶ καρπῶν ἀγαθῶν, ἀδιάκριτος, ἀνυπόκριτος. 3:18 καρπὸς δὲ δικαιοσύνης ἐν εἰρήνῃ σπείρεται τοῖς ποιοῦσιν εἰρήνην. 4:7 ὑποτάγητε οὖν τῷ θεῷ, ἀντίστητε δὲ τῷ διαβόλῳ καὶ φεύξεται ἀφ᾽ ὑμῶν, 4:8 ἐγγίσατε τῷ θεῷ καὶ ἐγγιεῖ ὑμῖν. καθαρίσατε χεῖρας, ἁμαρτωλοί, καὶ ἁγνίσατε καρδίας, δίψυχοι. 4:9 ταλαιπωρήσατε καὶ πενθήσατε καὶ κλαύσατε. ὁ γέλως ὑμῶν εἰς πένθος μετατραπήτω καὶ ἡ χαρὰ εἰς κατήφειαν. 4:10 ταπεινώθητε ἐνώπιον τοῦ κυρίου καὶ ὑψώσει ὑμᾶς. Who is wise and understanding among you? By his good conduct let him show his works in the meekness of wisdom. But if you have bitter jealousy and selfish ambition in your hearts, do not boast and be false to the truth. This is not the wisdom that comes down from above, but is earthly, unspiritual, demonic. For where jealousy and selfish ambition exist, there will be disorder and every vile practice. But the wisdom from above is first pure, then peaceable, gentle, open to reason, full of mercy and good fruits, impartial and sincere. And a harvest of righteousness is sown in peace by those who make peace. What causes quarrels and what causes fights among you? Is it not this, that your passions are at war within you? You desire and do not have, so you murder. You covet and cannot obtain, so you fight and quarrel. You do not have, because you do not ask. You ask and do not receive, because you ask wrongly, to spend it on your passions. You adulterous people! Do you not know that friendship with the world is enmity with God? Therefore whoever wishes to be a friend of the world makes himself an enemy of God. Or do you suppose it is to no purpose that the Scripture says, “He yearns jealously over the spirit that he has made to dwell in us”? But he gives more grace. Therefore it says, “God opposes the proud but gives grace to the humble.” Submit yourselves therefore to God. Resist the devil, and he will flee from you. Draw near to God, and he will draw near to you. Cleanse your hands, you sinners, and purify your hearts, you double-minded. Be wretched and mourn and weep. Let your laughter be turned to mourning and your joy to gloom. Humble yourselves before the Lord, and he will exalt you. 9:30 Κἀκεῖθεν ἐξελθόντες παρεπορεύοντο διὰ τῆς Γαλιλαίας, καὶ οὐκ ἤθελεν ἵνα τις γνοῖ· 9:31 ἐδίδασκεν γὰρ τοὺς μαθητὰς αὐτοῦ καὶ ἔλεγεν αὐτοῖς ὅτι Ὁ υἱὸς τοῦ ἀνθρώπου παραδίδοται εἰς χεῖρας ἀνθρώπων, καὶ ἀποκτενοῦσιν αὐτόν, καὶ ἀποκτανθεὶς μετὰ τρεῖς ἡμέρας ἀναστήσεται. 9:32 οἱ δὲ ἠγνόουν τὸ ῥῆμα, καὶ ἐφοβοῦντο αὐτὸν ἐπερωτῆσαι. 9:33 Καὶ ἦλθον εἰς Καφαρναούμ. καὶ ἐν τῇ οἰκίᾳ γενόμενος ἐπηρώτα αὐτούς, Τί ἐν τῇ ὁδῷ διελογίζεσθε; 9:34 οἱ δὲ ἐσιώπων· πρὸς ἀλλήλους γὰρ διελέχθησαν ἐν τῇ ὁδῷ τίς μείζων. 9:35 καὶ καθίσας ἐφώνησεν τοὺς δώδεκα καὶ λέγει αὐτοῖς, Εἴ τις θέλει πρῶτος εἶναι, ἔσται πάντων ἔσχατος καὶ πάντων διάκονος. 9:36 καὶ λαβὼν παιδίον ἔστησεν αὐτὸ ἐν μέσῳ αὐτῶν καὶ ἐναγκαλισάμενος αὐτὸ εἶπεν αὐτοῖς, 9:37 Ὃς ἂν ἓν τῶν τοιούτων παιδίων δέξηται ἐπὶ τῷ ὀνόματί μου, ἐμὲ δέχεται· καὶ ὃς ἂν ἐμὲ δέχηται, οὐκ ἐμὲ δέχεται ἀλλὰ τὸν ἀποστείλαντά με. They went on from there and passed through Galilee. And he did not want anyone to know, for he was teaching his disciples, saying to them, “The Son of Man is going to be delivered into the hands of men, and they will kill him. And when he is killed, after three days he will rise.” But they did not understand the saying, and were afraid to ask him. The following is from Luther’s Works, the American Edition: vol. 25, copyright © 1972 by Concordia Publishing House. All rights reserved. “We are in sin until the end of our life. For this reason blessed Augustine says: ‘Until our body is raised to life and death is swallowed up in victory, our evil desires will afflict us’ (Augustine, Expositio quarundam propositionum ex epistula ad Romanos, 35, Patrologia, Series Latina, XXXV, 2069). Likewise, we read in Gal. 5:17: ‘The desires of the flesh are against the Spirit, and the desires of the Spirit are against the flesh; for these are opposed to each other, to prevent you from doing what you would.’ And below, in Rom. 7:19 Paul says: ‘For I do not do the good I want, but the evil I do not want is what I do, etc.’ Again, in James 4:1: ‘What causes wars, and what causes fightings among you? Is it not your passions that are at war in your members?’ And in 1 Peter 2:11: ‘Abstain from the passions of the flesh that wage war against your soul.’ And in this way all the apostles and saints confess that sin and concupiscence remain in us, until the body returns to ashes and a new one is raised up without concupiscence and sin, as 2 Peter 3:13 puts it, ‘According to His promise we wait for new heavens and a new earth in which righteousness dwells,’ as if to say that sin dwells in this present world. Just so in Jer. 18:4 ff. in regard to the potter who repairs the broken vase by making another, the Lord says that He will do likewise. For the Lord hates this body of sin and is preparing to remake it into another; therefore He commands us to hate it also, to destroy and put it to death and to seek an escape from it and ‘the coming of His kingdom’ (Matt. 6:10). But this hatred and resistance toward the body of sin is not easy, in fact it is most difficult. As many works of pentience as can possibly be done are necessary for this, especially warnings against idleness” (LW 25:308–9). “Woe to the shepherds who destroy and scatter the sheep of my pasture!” declares the Lord. Therefore thus says the Lord, the God of Israel, concerning the shepherds who care for my people: “You have scattered my flock and have driven them away, and you have not attended to them. Behold, I will attend to you for your evil deeds, declares the Lord. Then I will gather the remnant of my flock out of all the countries where I have driven them, and I will bring them back to their fold, and they shall be fruitful and multiply. I will set shepherds over them who will care for them, and they shall fear no more, nor be dismayed, neither shall any be missing, declares the Lord. 2:11 Διὸ μνημονεύετε ὅτι ποτὲ ὑμεῖς τὰ ἔθνη ἐν σαρκί, οἱ λεγόμενοι ἀκροβυστία ὑπὸ τῆς λεγομένης περιτομῆς ἐν σαρκὶ χειροποιήτου, 2:12 ὅτι ἦτε τῷ καιρῷ ἐκείνῳ χωρὶς Χριστοῦ, ἀπηλλοτριωμένοι τῆς πολιτείας τοῦ Ἰσραὴλ καὶ ξένοι τῶν διαθηκῶν τῆς ἐπαγγελίας, ἐλπίδα μὴ ἔχοντες καὶ ἄθεοι ἐν τῷ κόσμῳ. 2:13 νυνὶ δὲ ἐν Χριστῷ Ἰησοῦ ὑμεῖς οἵ ποτε ὄντες μακρὰν ἐγενήθητε ἐγγὺς ἐν τῷ αἵματι τοῦ Χριστοῦ. 2:14 Αὐτὸς γάρ ἐστιν ἡ εἰρήνη ἡμῶν, ὁ ποιήσας τὰ ἀμφότερα ἓν καὶ τὸ μεσότοιχον τοῦ φραγμοῦ λύσας, τὴν ἔχθραν ἐν τῇ σαρκὶ αὐτοῦ, 2:15 τὸν νόμον τῶν ἐντολῶν ἐν δόγμασιν καταργήσας, ἵνα τοὺς δύο κτίσῃ ἐν αὐτῷ εἰς ἕνα καινὸν ἄνθρωπον ποιῶν εἰρήνην 2:16 καὶ ἀποκαταλλάξῃ τοὺς ἀμφοτέρους ἐν ἑνὶ σώματι τῷ θεῷ διὰ τοῦ σταυροῦ, ἀποκτείνας τὴν ἔχθραν ἐν αὐτῷ. 2:17 καὶ ἐλθὼν εὐηγγελίσατο εἰρήνην ὑμῖν τοῖς μακρὰν καὶ εἰρήνην τοῖς ἐγγύς· 2:18 ὅτι δι᾽ αὐτοῦ ἔχομεν τὴν προσαγωγὴν οἱ ἀμφότεροι ἐν ἑνὶ πνεύματι πρὸς τὸν πατέρα. 2:19 ἄρα οὖν οὐκέτι ἐστὲ ξένοι καὶ πάροικοι ἀλλὰ ἐστὲ συμπολῖται τῶν ἁγίων καὶ οἰκεῖοι τοῦ θεοῦ, 2:20 ἐποικοδομηθέντες ἐπὶ τῷ θεμελίῳ τῶν ἀποστόλων καὶ προφητῶν, ὄντος ἀκρογωνιαίου αὐτοῦ Χριστοῦ Ἰησοῦ, 2:21 ἐν ᾧ πᾶσα οἰκοδομὴ συναρμολογουμένη αὔξει εἰς ναὸν ἅγιον ἐν κυρίῳ, 2:22 ἐν ᾧ καὶ ὑμεῖς συνοικοδομεῖσθε εἰς κατοικητήριον τοῦ θεοῦ ἐν πνεύματι. Therefore remember that at one time you Gentiles in the flesh, called “the uncircumcision” by what is called the circumcision, which is made in the flesh by hands—remember that you were at that time separated from Christ, alienated from the commonwealth of Israel and strangers to the covenants of promise, having no hope and without God in the world. But now in Christ Jesus you who once were far off have been brought near by the blood of Christ. For he himself is our peace, who has made us both one and has broken down in his flesh the dividing wall of hostility by abolishing the law of commandments expressed in ordinances, that he might create in himself one new man in place of the two, so making peace, and might reconcile us both to God in one body through the cross, thereby killing the hostility. And he came and preached peace to you who were far off and peace to those who were near. For through him we both have access in one Spirit to the Father. So then you are no longer strangers and aliens, but you are fellow citizens with the saints and members of the household of God, built on the foundation of the apostles and prophets, Christ Jesus himself being the cornerstone, in whom the whole structure, being joined together, grows into a holy temple in the Lord. In him you also are being built together into a dwelling place for God by the Spirit. 6:30 Καὶ συνάγονται οἱ ἀπόστολοι πρὸς τὸν Ἰησοῦν καὶ ἀπήγγειλαν αὐτῷ πάντα ὅσα ἐποίησαν καὶ ὅσα ἐδίδαξαν. 6:31 καὶ λέγει αὐτοῖς, Δεῦτε ὑμεῖς αὐτοὶ κατ᾽ ἰδίαν εἰς ἔρημον τόπον καὶ ἀναπαύσασθε ὀλίγον. ἦσαν γὰρ οἱ ἐρχόμενοι καὶ οἱ ὑπάγοντες πολλοί, καὶ οὐδὲ φαγεῖν εὐκαίρουν. 6:32 καὶ ἀπῆλθον ἐν τῷ πλοίῳ εἰς ἔρημον τόπον κατ᾽ ἰδίαν. 6:33 καὶ εἶδον αὐτοὺς ὑπάγοντας καὶ ἐπέγνωσαν πολλοὶ καὶ πεζῇ ἀπὸ πασῶν τῶν πόλεων συνέδραμον ἐκεῖ καὶ προῆλθον αὐτούς. 6:34 καὶ ἐξελθὼν εἶδεν πολὺν ὄχλον καὶ ἐσπλαγχνίσθη ἐπ᾽ αὐτούς, ὅτι ἦσαν ὡς πρόβατα μὴ ἔχοντα ποιμένα, καὶ ἤρξατο διδάσκειν αὐτοὺς πολλά. 6:35 Καὶ ἤδη ὥρας πολλῆς γενομένης προσελθόντες αὐτῷ οἱ μαθηταὶ αὐτοῦ ἔλεγον ὅτι Ἔρημός ἐστιν ὁ τόπος καὶ ἤδη ὥρα πολλή· 6:36 ἀπόλυσον αὐτούς, ἵνα ἀπελθόντες εἰς τοὺς κύκλῳ ἀγροὺς καὶ κώμας ἀγοράσωσιν ἑαυτοῖς τί φάγωσιν. 6:37 ὁ δὲ ἀποκριθεὶς εἶπεν αὐτοῖς, Δότε αὐτοῖς ὑμεῖς φαγεῖν. καὶ λέγουσιν αὐτῷ, Ἀπελθόντες ἀγοράσωμεν δηναρίων διακοσίων ἄρτους καὶ δώσομεν αὐτοῖς φαγεῖν; 6:38 ὁ δὲ λέγει αὐτοῖς, Πόσους ἄρτους ἔχετε; ὑπάγετε ἴδετε. καὶ γνόντες λέγουσιν, Πέντε, καὶ δύο ἰχθύας. 6:39 καὶ ἐπέταξεν αὐτοῖς ἀνακλῖναι πάντας συμπόσια συμπόσια ἐπὶ τῷ χλωρῷ χόρτῳ. 6:40 καὶ ἀνέπεσαν πρασιαὶ πρασιαὶ κατὰ ἑκατὸν καὶ κατὰ πεντήκοντα. 6:41 καὶ λαβὼν τοὺς πέντε ἄρτους καὶ τοὺς δύο ἰχθύας ἀναβλέψας εἰς τὸν οὐρανὸν εὐλόγησεν καὶ κατέκλασεν τοὺς ἄρτους καὶ ἐδίδου τοῖς μαθηταῖς [αὐτοῦ] ἵνα παρατιθῶσιν αὐτοῖς, καὶ τοὺς δύο ἰχθύας ἐμέρισεν πᾶσιν. 6:42 καὶ ἔφαγον πάντες καὶ ἐχορτάσθησαν, 6:43 καὶ ἦραν κλάσματα δώδεκα κοφίνων πληρώματα καὶ ἀπὸ τῶν ἰχθύων. 6:44 καὶ ἦσαν οἱ φαγόντες [τοὺς ἄρτους] πεντακισχίλιοι ἄνδρες. The apostles returned to Jesus and told him all that they had done and taught. And he said to them, “Come away by yourselves to a desolate place and rest a while.” For many were coming and going, and they had no leisure even to eat. And they went away in the boat to a desolate place by themselves. Now many saw them going and recognized them, and they ran there on foot from all the towns and got there ahead of them. When he went ashore he saw a great crowd, and he had compassion on them, because they were like sheep without a shepherd. And he began to teach them many things. And when it grew late, his disciples came to him and said, “This is a desolate place, and the hour is now late. Send them away to go into the surrounding countryside and villages and buy themselves something to eat.” But he answered them, “You give them something to eat.” And they said to him, “Shall we go and buy two hundred denarii worth of bread and give it to them to eat?” And he said to them, “How many loaves do you have? Go and see.” And when they had found out, they said, “Five, and two fish.” Then he commanded them all to sit down in groups on the green grass. So they sat down in groups, by hundreds and by fifties. And taking the five loaves and the two fish, he looked up to heaven and said a blessing and broke the loaves and gave them to the disciples to set before the people. And he divided the two fish among them all. And they all ate and were satisfied. And they took up twelve baskets full of broken pieces and of the fish. And those who ate the loaves were five thousand men. The following is from Commentary on Jeremiah, by Theodore Laetsch, Concordia Classic Commentary Series, copyright © 1952 by Concordia Publishing House. All rights reserved. “We must not overlook the unusual manner in which this name is introduced. The Lord does not merely say: His name is or shall be (e.g., Gen. 17:5b; Exek. 48:35), nor: Call Him (Gen. 16:14; 33:20; 35:7; Judg. 6:24), nor: Call His name (Gen. 16:11, 13; 21:3; 22:14; Ex. 17:15), nor: This shall He be called (Jer. 33:16). He uses a phraseology unique in the entire Old Testament, occurring only here. ‘And this (is) His name which one shall call Him.’ That is not idle redundancy. Two facts of greatest importance are stressed. The first one: ‘This (is) His name.’ Name, as used here by the Lord, is not a mere label or tag, but designates the very nature, the essence and being of the Branch. And secondly, He expresses His will that mankind should know this Zemach and acknowledge Him and call Him by that name, given to Him by the Lord God of Hosts, which describes to us His most inmost essence, as Jehovah Himself knows and understands it. God is not satisfied if one merely calls His Messiah a man, or the Branch of David, or the Righteous One, or the Wise and Understanding One, or the King and Ruler, or the Executor of Judgment and Justice, or the Establisher of a new world order, or the Prince of Peace and Security. No, though He is all that, and all that in the highest possible sense, far excelling the sense in which these terms are usually understood in our day, the Christ of God is far more than that. . . . This is His name, which I, the Lord, give to Him, and which one shall call Him, Lord, Jehovah, I Am That I Am. The Messiah our Savior is, with the Holy Ghost, Most High in the glory of God the Father, God of God, Light of Light, Very God of Very God, being of one substance with the Father” (p. 195). Behold, the days are coming, declares the Lord, when I will make a new covenant with the house of Israel and the house of Judah, not like the covenant that I made with their fathers on the day when I took them by the hand to bring them out of the land of Egypt, my covenant that they broke, though I was their husband, declares the Lord. For this is the covenant that I will make with the house of Israel after those days, declares the Lord: I will put my law within them, and I will write it on their hearts. And I will be their God, and they shall be my people. And no longer shall each one teach his neighbor and each his brother, saying, “Know the Lord,” for they shall all know me, from the least of them to the greatest, declares the Lord. For I will forgive their iniquity, and I will remember their sin no more. 5:1 Πᾶς γὰρ ἀρχιερεὺς ἐξ ἀνθρώπων λαμβανόμενος ὑπὲρ ἀνθρώπων καθίσταται τὰ πρὸς τὸν θεόν, ἵνα προσφέρῃ δῶρά τε καὶ θυσίας ὑπὲρ ἁμαρτιῶν, 5:2 μετριοπαθεῖν δυνάμενος τοῖς ἀγνοοῦσιν καὶ πλανωμένοις, ἐπεὶ καὶ αὐτὸς περίκειται ἀσθένειαν 5:3 καὶ δι᾽ αὐτὴν ὀφείλει, καθὼς περὶ τοῦ λαοῦ, οὕτως καὶ περὶ αὐτοῦ προσφέρειν περὶ ἁμαρτιῶν. 5:4 καὶ οὐχ ἑαυτῷ τις λαμβάνει τὴν τιμὴν ἀλλὰ καλούμενος ὑπὸ τοῦ θεοῦ καθώσπερ καὶ Ἀαρών. 5:7 ὃς ἐν ταῖς ἡμέραις τῆς σαρκὸς αὐτοῦ δεήσεις τε καὶ ἱκετηρίας πρὸς τὸν δυνάμενον σῴζειν αὐτὸν ἐκ θανάτου μετὰ κραυγῆς ἰσχυρᾶς καὶ δακρύων προσενέγκας καὶ εἰσακουσθεὶς ἀπὸ τῆς εὐλαβείας, 5:8 καίπερ ὢν υἱός, ἔμαθεν ἀφ᾽ ὧν ἔπαθεν τὴν ὑπακοήν, 5:9 καὶ τελειωθεὶς ἐγένετο πᾶσιν τοῖς ὑπακούουσιν αὐτῷ αἴτιος σωτηρίας αἰωνίου, 5:10 προσαγορευθεὶς ὑπὸ τοῦ θεοῦ ἀρχιερεὺς κατὰ τὴν τάξιν Μελχισέδεκ. For every high priest chosen from among men is appointed to act on behalf of men in relation to God, to offer gifts and sacrifices for sins. He can deal gently with the ignorant and wayward, since he himself is beset with weakness. Because of this he is obligated to offer sacrifice for his own sins just as he does for those of the people. And no one takes this honor for himself, but only when called by God, just as Aaron was. In the days of his flesh, Jesus offered up prayers and supplications, with loud cries and tears, to him who was able to save him from death, and he was heard because of his reverence. Although he was a son, he learned obedience through what he suffered. And being made perfect, he became the source of eternal salvation to all who obey him, being designated by God a high priest after the order of Melchizedek. 10:32 Ἦσαν δὲ ἐν τῇ ὁδῷ ἀναβαίνοντες εἰς Ἱεροσόλυμα, καὶ ἦν προάγων αὐτοὺς ὁ Ἰησοῦς, καὶ ἐθαμβοῦντο, οἱ δὲ ἀκολουθοῦντες ἐφοβοῦντο. καὶ παραλαβὼν πάλιν τοὺς δώδεκα ἤρξατο αὐτοῖς λέγειν τὰ μέλλοντα αὐτῷ συμβαίνειν 10:33 ὅτι Ἰδοὺ ἀναβαίνομεν εἰς Ἱεροσόλυμα, καὶ ὁ υἱὸς τοῦ ἀνθρώπου παραδοθήσεται τοῖς ἀρχιερεῦσιν καὶ τοῖς γραμματεῦσιν, καὶ κατακρινοῦσιν αὐτὸν θανάτῳ καὶ παραδώσουσιν αὐτὸν τοῖς ἔθνεσιν 10:34 καὶ ἐμπαίξουσιν αὐτῷ καὶ ἐμπτύσουσιν αὐτῷ καὶ μαστιγώσουσιν αὐτὸν καὶ ἀποκτενοῦσιν, καὶ μετὰ τρεῖς ἡμέρας ἀναστήσεται. 10:35 Καὶ προσπορεύονται αὐτῷ Ἰάκωβος καὶ Ἰωάννης οἱ υἱοὶ Ζεβεδαίου λέγοντες αὐτῷ, Διδάσκαλε, θέλομεν ἵνα ὃ ἐὰν αἰτήσωμέν σε ποιήσῃς ἡμῖν. 10:36 ὁ δὲ εἶπεν αὐτοῖς, Τί θέλετέ [με] ποιήσω ὑμῖν; 10:37 οἱ δὲ εἶπαν αὐτῷ, Δὸς ἡμῖν ἵνα εἷς σου ἐκ δεξιῶν καὶ εἷς ἐξ ἀριστερῶν καθίσωμεν ἐν τῇ δόξῃ σου. 10:38 ὁ δὲ Ἰησοῦς εἶπεν αὐτοῖς, Οὐκ οἴδατε τί αἰτεῖσθε. δύνασθε πιεῖν τὸ ποτήριον ὃ ἐγὼ πίνω ἢ τὸ βάπτισμα ὃ ἐγὼ βαπτίζομαι βαπτισθῆναι; 10:39 οἱ δὲ εἶπαν αὐτῷ, Δυνάμεθα. ὁ δὲ Ἰησοῦς εἶπεν αὐτοῖς, Τὸ ποτήριον ὃ ἐγὼ πίνω πίεσθε καὶ τὸ βάπτισμα ὃ ἐγὼ βαπτίζομαι βαπτισθήσεσθε, 10:40 τὸ δὲ καθίσαι ἐκ δεξιῶν μου ἢ ἐξ εὐωνύμων οὐκ ἔστιν ἐμὸν δοῦναι, ἀλλ᾽ οἷς ἡτοίμασται. 10:41 Καὶ ἀκούσαντες οἱ δέκα ἤρξαντο ἀγανακτεῖν περὶ Ἰακώβου καὶ Ἰωάννου. 10:42 καὶ προσκαλεσάμενος αὐτοὺς ὁ Ἰησοῦς λέγει αὐτοῖς, Οἴδατε ὅτι οἱ δοκοῦντες ἄρχειν τῶν ἐθνῶν κατακυριεύουσιν αὐτῶν καὶ οἱ μεγάλοι αὐτῶν κατεξουσιάζουσιν αὐτῶν. 10:43 οὐχ οὕτως δέ ἐστιν ἐν ὑμῖν, ἀλλ᾽ ὃς ἂν θέλῃ μέγας γενέσθαι ἐν ὑμῖν ἔσται ὑμῶν διάκονος, 10:44 καὶ ὃς ἂν θέλῃ ἐν ὑμῖν εἶναι πρῶτος ἔσται πάντων δοῦλος· 10:45 καὶ γὰρ ὁ υἱὸς τοῦ ἀνθρώπου οὐκ ἦλθεν διακονηθῆναι ἀλλὰ διακονῆσαι καὶ δοῦναι τὴν ψυχὴν αὐτοῦ λύτρον ἀντὶ πολλῶν. The following is from Commentary on Jeremiah and Lamentations, Concordia Classic Commentary series, by Norman C. Habel, copyright © 1968 Concordia Publishing House. All rights reserved. “The final word in this prophetic dream of hope provides the basis and ground for the entire vision. Thus it is introduced by ‘for,’ or ‘because.’ ‘For I will forgive their iniquity,’ states the Lord. In contrast to this statement stands the forthright proclamation of Jeremiah that the sins of God’s people cannot be erased (17:1) and that the people are controlled by the violent forces of evil that they have set in motion. No rite could ward off this evil. Only a miracle could save Israel from final rejection under God’s judgment. And that miracle is found in the free forgiveness of Yahweh. He will forgive and forget” (p. 248). 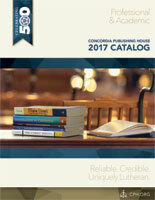 Check out the Professional and Academic Books catalog.